Here are the quotes from G. C. Berkouwer that I've mentioned a few times which I've found so helpful in understanding how justification is the engine of sanctification, or how the gospel that "Christ died for our sins" is itself what propels growth in godliness. These are from his book Faith and Sanctification. I confess I wish I had heard more of the newly imported foreign power of the indwelling Spirit as that which gives believers new spiritual taste buds to pant after holiness (Berkouwer interacts with Bavinck on this point on pp. 82-84, and I find Bavinck much more convincing); but this hardly detracts from how meaningful I have found Berkouwer to be on this most practical of questions of Christian growth. The best evangelical theological work emerges from delight in the Christian gospel, for the gospel announces a reality which is in itself luminous, persuasive, and infinitely satisfying. That reality is Jesus Christ as he gives himself to be an object for creaturely knowledge, love, and praise. To think evangelically about this one is to think in his presence, under the instruction of his Word and Spirit, and in the fellowship of the saints. --John Webster, "Jesus Christ," in Cambridge Companion to Evangelical Theology (Cambridge: Cambridge University Press, 2007), 60; a wonderful statement which did, to my relief, go on to affirm that "the ultimate resource is the text . . . for the text is an act of God's self-disclosure"
In Mike Bullmore's excellent workshop at the Gospel Coalition, "The Functional Centrality of the Gospel," Mike commended to us a little book by Milton Vincent called A Gospel Primer for Christians: Learning to See the Glories of God's Love. Milton is a pastor in California. Mike's comments piqued my interests and I immediately ordered a used copy of the 90-page paperback from Amazon when I got home. The book looks very good. The point of it is just what I've been discovering myself these days (don't know why it's taking me so long--though I expect in 40 years it will still feel like it's just beginning to sink in!) that the gospel is for believers, not just unbelievers. I had never heard of the book before Mike's recommendation but I look forward to diving in this week. C. S. Lewis' favorite psalm was Ps. 19 (below for reference). In a 1956 letter to Mary van Deusen he explains why. First, the mere glory of nature (between the Psalms and Wordsworth - a long gap in history - you get nothing equal to either on this theme). The the disinfectant, inexorable sun beating down on the desert and 'nothing hid from the heat thereof.' Then - implied, not stated - the imaginative identification of that heat and light with the 'undefiled' law, the 'clean' fear of the Lord, searching every cranny. Then the characteristically Jewish feeling that the Law is not only obligatory but beautiful, ravishing: delighting the heart, better than gold, sweeter than honey. Only after that, the (more Christian like) self examination and humble petition. Nearly all that could be said before the Incarnation is said in this Psalm. It is so much better Paganism than the real pagans ever did! And in one way more glorious, more soaring and triumphant, than Christian poetry. For as God humbled Himself to become Man, so religion humbled itself to become Christianity. In his OT theology (Zondervan 2007), Bruce Waltke helpfully suggests that "the center of the Old Testament, the message that accommodates all its themes, is that Israel's sublime God, whose attributes hold in tension his holiness and mercy, glories himself by establishing his universal rule over his volitional creatures on earth through Jesus Christ and his covenant people" (p. 144). Isn't duty only a second-best to keep one going until one learns to like the thing, and then it is a duty no more? When love fulfills the Law, Law (as such) flies out of the window. Isn't that part of what St. Paul meant by being free from the Law? And of what St. Augustine meant by 'Have charity and do what you like'? Some of you know I'm working through the connection between the gospel and growth, or justification and sanctification. 2 Peter opens with a reminder that God's "divine power has granted to us all things that pertain to life and godliness," then exhorts us to "make every effort to supplement" our faith with: virtue, knowledge, self-control, and so on. The point is, this is dealing with the general theological area of sanctification. Growth. And in light of what I'm slowly becoming convinced of this year--that, against our instincts, it is the gospel itself that fuels sanctification--I was arrested by the principle Peter puts beneath all this "effort": "For (gar) whoever (universal statement) lacks these qualities is so nearsighted that he is blind, having forgotten that he was cleansed from his former sins" (1:9). Amazing. Not growing in virtue, self-control, godliness . . . ? You've forgotten the very gospel that got you in in the first place. You were cleansed from those former sins. As you remember that (note "having forgotten"), "these qualities are yours and are increasing" (v. 8). Off to the Gospel Coalition tomorrow. At the end of the week I'll get up some quotes from Berkouwer's Faith and Sanctification that have further hammered these nails home. According to Theopedia, German theologian Wolfhart Pannenberg, who is proving helpful to me as I write a paper on the Trinity, in high school "experienced an 'intellectual conversion' and decided that Christianity was the best available religious option." On the one hand, I understand what is meant here and I receive it. I know that "religious" is being used here in a generic way. And I acknowledge that for many (C. S. Lewis e.g.) conversion feels largely intellectual. Certainly, God does not (normally) bypass the brain when mediating grace. Yet this is just the kind of statement that propagates a deeply defective view of Christianity. Christianity is not the best available religious option; it is the one religion in which we are freed to give up on religion. It is the only faith that grants access via the door of self-despair and failure rather than self-actualizing success. Jesus didn't come to tell us about the best religion; he came to end all religion. He is God's alternative to religion. Religion and Christianity are mutually-exclusive options. A few of you were wondering what happened to the posts from Mar 13 to Apr 13. I finally figured out that if you view this blog via Internet Explorer, those posts do not appear (and only the first paragraph of the Unlocking Romans post). If you use Firefox, no problems. Weird. This issue aside, I have been much more satisfied with Firefox than Explorer and encourage you to switch if you haven't already. Imagine yourself standing on the beach at 1:33. The typological understanding of the Old Testament was not an exegetical method but a distinctly defined angle of vision. . . . Looking back from the Christ event Paul observed in persons, institutions, or events of the Old Testament advance signals of God's activity in the end time. These types were not something like historical analogies. They were God's connections to the human being that were witnessed to by the Old Testament and that announced--positively or antithetically--a corresponding but at the same time eschatologically elevated, final connection. The announcement character rested on God's loyalty to his promise. I've been listening to Lloyd-Jones for the past year or so (when I discovered the podcast), and normally he has a unique gift to put me to sleep. Not sure why. 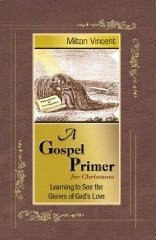 His written sermons are different--helpful, gripping, moving. But for some reason I have the hardest time staying with him mentally when I listen to him. But this morning I listened to the Mar 15 broadcast from the Martin Lloyd-Jones Recording Trust, "The Refuge of God Part 2," available here. I think I see now what all the fuss is about--why Piper, at the Gospel Coalition two years ago, called him the greatest preacher of the twentieth century.